This subscription service is a semi-annual or annual, comparative review of a program's performance that is designed to help educators and administrators identify their program's areas of strength and weakness. Jurisdictional and national rankings are used to describe the program's strengths and weakness regarding: client needs, the nursing process, categories of human functioning and health alterations, the wellness-illness continuum, the stages of maturity and stress-adaptation-coping. Program-specific information is reported provided at least 10 first-time candidates tested within the six-month reporting period. Candidate-specific information is not available. Canadian nursing education programs can now begin registering for the NCLEX Program Reports on the Mountain Measurement website. 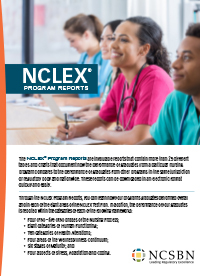 Programs can also find detailed information on NCLEX program report subscription cost and general information on the NCLEX program reports on the Mountain Measurement website. 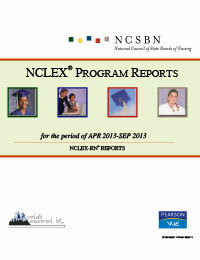 Join hundreds of educators across the country who subscribe to NCLEX Program Reports. These reports are the only source for detailed information about your graduates' performance on the NCLEX examinations.